Rudyard Kipling was born on December 30, 1865 in Bombay, British India and died on January 18, 1936 in London. He penned "The Drums of the Fore and Aft" as testament to one of the British and Indian battles against the Afghans during the Second Afghan War (circa 1870-1880). It aired as a radio play on Escape on July 14, 1949. 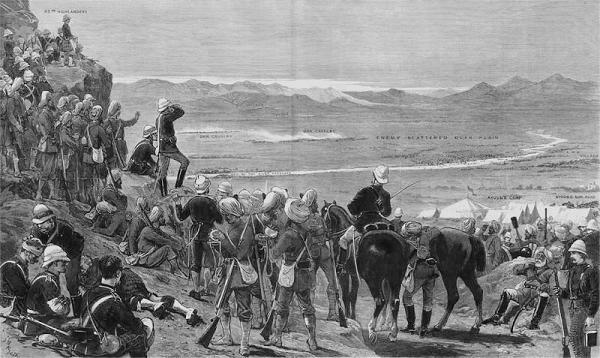 This excellent dramatization recounts the activities of a British Regiment before and during a battle with the Afghans in northern India during the period of British colonial empire, and focuses primarily on two under aged lads--a fife player and a drummer--(ne'er-do-wells always getting into trouble and looked down on by the regular soldiers) who beg their commander not to leave them behind in the upcoming battle. It is a genuinely human tale of heroism and bravery, at once heart-wrenching and inspirational. And, as you will hear, fertile ground for the properly told Alternate History story.